SUBHEAD: Extending the glide just gives you more time to find a safe place for the crash landing. 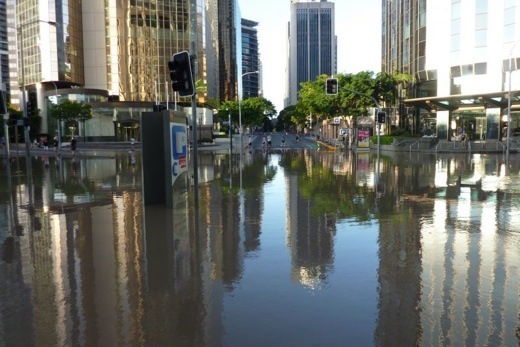 Image above: Photo of flooded intersection of Eagle and Charlotte Streets in Brisbane, Australia in 2011 by Andrew Kesper.zFrom original article. I first met Professor Jem Bendell at a festival in the middle of a Swedish forest. This was back around the beginning of the 2010s, and he wasn’t a professor in those days, and to be honest we didn’t find that much in common. The festival was called Future Perfect. The organizers had brought together sustainability thinkers, ecologically-minded designers, organic food entrepreneurs and a whole smorgasbord of buzzwords. At several points, I was provoked into forceful interventions, which led to the invention of the role of ‘difficultator’ – a kind of anti-facilitator or heckler-in-residence – in which capacity they invited me back the following year. My impression of Jem from that event was of a big NGO, sustainable development, Corporate Social Responsibility guy. He was living in Geneva, working as a consultant to the UN. He’d done things: the Marine Stewardship Council was one of his projects, and he’d been in at the beginning of the UN Global Compact. He was all about getting big business to drive sustainability. He struck me as driven, ambitious, serious, but I didn’t get much sense of someone wrestling with the existential implications of the mess in which we find ourselves. And fair play, he was too busy for that. So it came as a surprise when we crossed paths again last year and he told me that Dark Mountain had been much on his mind. I’d been aware of the ripples made by a keynote that he had given at a climate change conference in Australia, setting out an agenda for what he calls Deep Adaptation, based around the three ‘R’s of Resilience, Relinquishment and Restoration. It’s been picked up in places like the Planet B festival in Peterborough last summer and a forthcoming season of events at the NewBridge Project in Newcastle – while Charlotte Du Cann wrote about it in the call for submissions for the next Dark Mountain book. When I caught up with Jem over Skype a few weeks ago, I mentioned that I’d been struck by how far he had traveled since our first meeting, so I was curious to know what had set him on that journey. JB: I gave my inaugural professorial talk in March 2014 at a big literary festival in Cumbria. I’d already become aware of some of the latest science on climate change, so I decided to frame sustainability as an adventure – to say that we have to let go of our incremental, non-ambitious, conformist approaches. I gave a speech about that, because it was a frame that could be palatable to my colleagues, my employer, my academia and my audience. But I was coming down with the flu during the speech. And for the week after, I was in bed ill.
There’s something emotional about a conclusion – that’s what you do in an inaugural lecture, you try and synthesise twenty years of your work, and by summarizing, you’re also concluding it. So I spent that week in bed, with a fever, not doing much apart from reading scientific papers and watching traumatizing videos from the Arctic. And I actually went into despair. It took years before I became more deliberate and public about this, and in a way it’s taken me until now to realize that I’ve been going through a professional catharsis which goes back to March 2014. DH: I read a piece that you wrote for openDemocracy later that year, arguing that the mainstream debate around climate change had become detached from the facts that were now coming in from the science. You highlight four different conversations going on around the edges which you say have more to do with the reality of where we find ourselves, one of which is a conversation you identify with the radical end of Transition Towns, the work of people like Charles Eisenstein, as well as with Dark Mountain. JB: The reason I wrote that article was that after the experience I’d had that year, I couldn’t help but have conversations with friends about this topic, and I found that I just left people sort of staring into space with their jaws wide open. So I wanted to give them something that would help them think things through, and then they could end up with whichever of those agendas that I mapped out in the piece – and working on any of those agendas would be better than the mainstream denial of how things are. DH: That brings me to the speech where you presented what you call the Deep Adaptation agenda. Can you say a bit about how you arrived at that framing? JB: Looking back over the last few years, I didn’t really know what to do about this realisation that we can’t fix climate change, that so much of the impact for our civilisation is already locked in. I didn’t know how to work on that. And I realized that one of the reasons was the lack of a framework to get your head around all this. So I thought it might be useful to come up with a map for people who are climate experts, policymakers, researchers about what this might mean. A map that would sound approachable, but would actually be the thin end of a wedge, in terms of where it would take them. This coincided with an invitation to a place in Australia where I used to work, Griffith University. It was the tenth anniversary of their centre and they invited me to give the keynote. They are at the center of the climate change adaptation network of Australia, so they had hundreds of climate change policymakers coming from across the country, and researchers and academics. And I couldn’t justify flying down there and just giving a speech about, you know, the latest great ideas about investment in solar, and so on. I was a bit scared, because I knew the guy who was organizing the conference and I knew he’d want me to be dynamic. Everyone who’s organizing a conference wants to be upbeat – and suddenly the keynote person is going to give a speech about the end of the world, or that’s how it might come across, anyway. It was a bit of a coming out. Standing in front of these climate experts who work with this all day and saying: well, this is my reality, this is what I’m struggling with, and this is a map that I have that I think we could use to work on it. I called it Deep Adaptation. I introduced the three ‘R’s: Resilience, Relinquishment and Restoration. DH: So this is where you’re trying to say, OK, what kind of stuff is worth working on, if you start from climate change as an unfolding tragedy, rather than as a problem that can be fixed and made to go away. Can you just elaborate on what falls within each of those three spheres? JB: Sure, well the first one – Resilience – I chose because it’s so mainstream already in the adaptation field. Even in the business schools and the sustainability field, the term resilience had become popular. Because businesses have been experiencing, through their supply chains in particular, disturbances and disruptions through weather events correlated with climate change. So for example, I was talking in a hall which was next to the Brisbane River, which had had flood water lapping at its doors just a year previously – and I pointed out that the place had been refurbished with the electric sockets still near the ground. We need to think again, to switch our mind-sets. These once-in-a-century events will be happening every five years, so resilience needs to wake up to that. That brings you into Relinquishment which is about not just, how do we preserve what we want to preserve, but what do we need to let go of? Because if we don’t let go of it, we’ll make matters worse. And I felt that the discourse of sustainability would have seen that previously as peculiar and defeatist – and I wanted to say that, we’re going to have to let a whole lot of things go, ways of life, cultural patterns. You know, in that room we were all wearing suits with ironed shirts and ties, with blasting air con. There are patterns of behavior which we have to let go of – and I thought, give it a fancy name and you re-code it as something interesting, rather than defeatist. Then the third one, Restoration – again, it exists already, with people talking about the restorative dimension of environmentalism, restoring ecosystems. Not just stopping the damage, but improving things. But for me, I wasn’t saying that in terms of how we can fix everything, but that you rewild because it is going to happen anyway and you build that into your thinking. But it’s also about restoration in terms of how did people have joy, fun and love, and wonder, celebration and meaning, prior to this hydrocarbon civilization? DH: So you said you were nervous in the run-up to that speech. What kind of reaction did you get? JB: I was surprised and delighted at the warm round of applause and the things people were saying to me afterwards. I remember one lady came up to me and said she used to be a pilot in the Outback of Australia and in her training, they used to do quite a spooky exercise which was called ‘extend the glide’. And it’s about, if the aircraft has a problem with the engines and they cut out, how do you then extend the glide to just give yourself more time to find yourself a safer place for the crash landing, but also on the off-chance that the engines might kick in again. And she said, that’s what you’re inviting us to start working on: how do we extend the glide? There were other people coming up to me and what I understood was that they had already been talking about these things in their own ways, making sense of it, but not really in their day-jobs, despite being paid to be environmental professionals. DH: How has this changed the work you’re doing – that experience of despair and catharsis that you described, going back to 2014, and then creating a framework for those who want to work with this professionally – where has that taken you in the years since? JB: Well, in 2017 it took me into politics, writing speeches for Jeremy Corbyn and John McDonnell, because it seems to me that we need a cultural shift towards compassion and a spiritual awakening, an awakening from the delusion of materialism. We don’t see much of that in politics, but Corbyn was saying something similar in a secular way. Meanwhile, I decided to approach education in a very different way, as a sort of emancipation from your received assumptions and received wisdom, as a preparation for people to be able to approach these very disturbing and troubling times. But also to see it as an amazing – it’s kind of crazy to say, isn’t it – an amazing opportunity for reflection into the true meaning of being alive. Because climate change is holding up a severe mirror to our consciousness: it means we have to really ask why we are here. Because somehow, we delay that question, and now we can’t. So on the one hand, I see that I’ve been doing quite a lot of stuff that I’m OK with that flows from that point in 2014, but I also realise that part of this has been getting busy in order to distract myself, because I didn’t have a good way of living with this knowledge. My sense of self-worth as a good guy, working hard, becoming an expert, becoming a professor – along the way, I made sacrifices in order to achieve that, and then suddenly I had a loss of a sense of self-worth, my role, my identity in life. So I think quite a bit of what I’ve been doing over the past years has been reconstituting a sense of self. So thank you for inviting me to talk about this, because it made me reflect in the last few days, and I realise that maybe it’s useful to share this. Because this cathartic process that I went through, some of it conscious and some of it actually only making sense to me looking back, is perhaps something that other people will go through and need to go through. And maybe it’s something we can go through together and help each other. I guess I’ve gone through a grieving process and now I realize that it was pretty damn obvious that I will die, everyone I know will die, any community or culture I could ever contribute to will die out, this human species will die out, and the Earth and everything on it will die – well, that’s just obvious, we all knew that, anyway. JB: I feel free of some forms of delusion, some forms of social pressure, and I am approaching things with fascination and playfulness. And what I didn’t have over the past few years were fellow travelers and community, and now I’m realizing that I do need a community around this very realization that we’ve been talking about. And what will emerge from that, I don’t know, but there will be love within it, there will be creativity within it, there will be a sense of wonder at being alive at this incredibly strange moment in human history. • Jem Bendell is Professor of Sustainability Leadership at the University of Cumbria. He is now taking applications for full- and part-time PhD students to work on aspects of deep adaptation, to be located in Cumbria or remotely, with a start on 1 October, 2018.